Turmeric: Curcumin, the active component of turmeric, is an object of research owing to its properties that suggest they may help to turn off certain genes that cause scarring and enlargement of the heart. Regular intake may help reduce low-density lipoprotein (LDL) or bad cholesterol and high blood pressure, increase blood circulation and prevent blood clotting, helping to prevent heart attack. Cardamom: This is a thermogenic herb that increases metabolism and helps burn body fat. Cardamom is considered one of the best digestive aids and is believed to soothe the digestive system and help the body process other foods more efficiently. Chillies: Foods containing chillies are said to be as foods that burn fat. Chillies contain capsaicin that helps in increasing the metabolism. Capsaicin is a thermogenic food, so it causes the body to burn calories for 20 minutes after you eat the chillies. Garlic: An effective fat-burning food, garlic contains the sulphur compound allicin which has anti-bacterial effects and helps reduce cholesterol and unhealthy fats. Mustard oil: This has low saturated fat compared to other cooking oils. It has fatty acid, oleic acid, erucic acid and linoleic acid. It contains antioxidants, essential vitamins and reduces cholesterol, which is good for the heart. Cabbage: Raw or cooked cabbage inhibits the conversion of sugar and other carbohydrates into fat. Hence, it is of great value in weight reduction. Buttermilk: It is the somewhat sour, residual fluid that is left after butter is churned. The probiotic food contains just 2.2 grams of fat and about 99 calories, as compared to whole milk that contains 8.9 grams fat and 157 calories. Regular intake provides the body with all essential nutrients and does not add fats and calories to the body. It is thus helpful in weight loss. 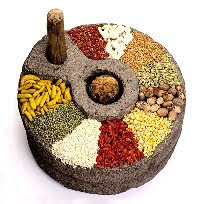 Millets: Fibre-rich foods such as millets - jowar, bajra, ragi, etc - absorb cholesterol and help increase the secretion of the bile that emulsifies fats.